Tomorrow, Britain gets to cast a vote on its continued membership in the European Union, although it is unclear how binding such a vote would be on the Government. Probably not binding at all. The latest opinion polls are giving it 51 per cent remain to 49 per cent leave. The bookie odds are in favour of the remain camp. I am guessing the remain vote will win. It shouldn’t. The debate has been asinine to say the least. The public deception has reached unbelievable heights. My own profession has been wheeled out or wheeled themselves out in grand statements about how catastrophic exit would be. I don’t believe much of it at all. I provided my opinion on the topic in this February 23, 2016 blog – If I was in Britain I would not want to be in the EU. I will not repeat the analysis here. But in the research I have been doing on how the Left has become neo-liberal, there was a lot of overlap in how the Left became, to their detriment, pro-Europe. Here is some points on that. I hope the Exit wins. As part of my research on the way the British Left evolved, I have dug up a lot of material on the divisive debate in 1972 surrounding the European Communities Bill. The debate in Britain about the proposed European Communities Bill 1972 was rather divisive. It is interesting that the No vote was supported by the extremes on the left and the right, not to different to today. I understand a lot of left-wingers are reluctant to vote EXIT because the likes of the looney Nigel Farage is pushing for that. I am not sympathetic to very much that the right politicians espouse and do not think voting to leave is tantamount to nurturing their whacky ideas. But they are correct to advocate an exit. Similar to today, the No camp was made up of an unholy alliance led by the extreme right-wing views of Enoch Powell, famous for his Rivers of Blood Speech and Tony Benn, a socialist Labour MP from the Left. Powell was a racist no doubt who opposed immigration, anti-discrimination legislation and all the rest of it. But he was correct in his assessment of the loss of democracy that accession would entail. But if we are to prove –– if we have to prove –– our Europeanism by accepting that French is the dominant language in the Community, then my answer is quite clear, and I will say it in French in order to prevent any misunderstanding: Non, merci beaucoup. The British Labour leader Harold Wilson was also not particularly enamoured with the idea of joining the European Community but in the lead up to the Bill he agreed to support the principle of joining but to question some of the terms of the entry (particularly in relation to pricing under the Common Agricultural Policy). 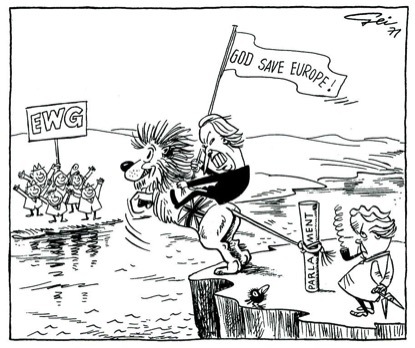 This cartoon appeared in 1971 by cartoonist Hans Geisen to capture the domestic constraints that Prime Minister Heath faced in pushing his zeal for Europe. Source: GEISEN, Hans. 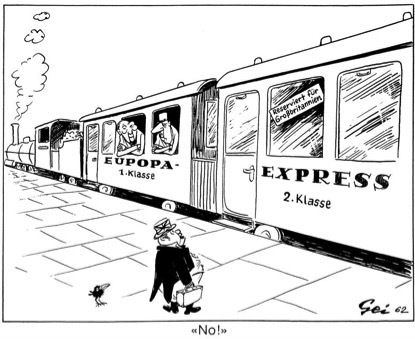 30 Jahre politische Karikaturen 1958-1988, Eine Auswahl der besten und bisher unveröffentlichten Karikaturen. Basel: Basler Zeitung, 1988. 156 S. ISBN 3-85815-171-X. The early 1970s accession was complicated initially by the resistance of Norway who disputed proposed sea boundaries relating to its fishing operations. British Prime Minister Heath sent the Norwegians an ultimatum on November 29, 1971 to his Norwegian counterpart (Trygve Bratteli) saying that Norway’s demands were “intransigent” and that Britain would continue on with or without Norway. The whole history of political progress is a history of gradual abandonment of national sovereignty … The question is not whether sovereignty remains absolute or not, but in what way one is prepared to sacrifice sovereignty, to whom and for what purpose … whether any proposed surrender of sovereignty will advance our progress to the kind of world we all want to see. The vehemently ‘pro-European’ Prime Minister Edward Heath targetted Labour MPs with similar sentiments as a means of overcoming the hostility within his own ranks, led by Enoch Powell. I do not believe that this nation, which has maintained and defended its independence for a thousand year, will now submit to set it merged or lost. Nor did I become a member of a sovereign parliament in order to consent to that sovereignty being abated or transferred. It shows first that it is an inherent consequence of accession to the Treaty of Rome that this House and Parliament will lose their legislative supremacy. It will no longer be true that law in this country is made only by or with the authority of Parliament—which in practice means the authority of this House. The legislative omni-competence of this House, its legislative sovereignty, has to be given up. The second consequence … is that this House loses its exclusive control—upon which its power and authority has been built over the centuries—over taxation and expenditure … For the first time for centuries it will be true to say that the people of this country are not taxed only upon the authority of the House of Commons. In archives from the Foreign and Commonwealth Office (FCO) from 1971, the document FCO 30/1048 – released to the public in September 2012, is fascinating reading. It numbers some 224 pages and is a 203 mb download. It discusses the “legal and constitutional implications of entry of UK into EEC” and appears to have gone before the British Cabinet on June 17, 1971. It included a “Factsheet on Sovereignty” to summarise the implications. A more complete discussion of sovereignty followed and it is a fascinating exercise in trying to obscure the reality. They distinguish between “sovereignty” and the “the realities of power”, and say “it is the latter which count”. An example they give is the “UN General Assembly, where, for example Mauritius has the same vote as the US (but the realities of power are reflected by the veto in the Security Council”. These external constraints thus are often accepted by nation states in the “pursuit of national interests”. And so the typical argument was presented where the “increasing interdependence of modern states and the development of economic and other links which cut across national boundaries” has limited the “degree of independence of action” by sovereign states. Further on, the briefing report does say admit that within the UK “the notion of sovereignty is bound up with the doctrine of Parliamentary Sovereignty” which involves “the exclusive power to make supreme law”. 1. The Parliament makes “any law it wishes”. 2. “there is no legislative power in the land save by the authority of Parliament”. So how would accession change this? But it is not correct to regard the European Community Treaties as involving solely matters of a legal significance equivalent to that of other existing treaties. For example, in matters within the Community field (see Annex) we shall be accepting an external legislature which regards itself as having direct powers of legislating with effect within the United Kingdom, even in derogation of United Kingdom statutes, and as having in certain fields exclusive legislative competence, so that our own legislature has none; in matters in which the Community has already adopted a common policy, we shall be accepting that the Commission will jointly represent the Member States, who to that extent will have their individual international negotiating powers limited; and we shall in various fields be accepting a wide degree of coordination of our policy with that of the rest of the Community. All of this we shall be accepting “for an unlimited period”, with no provision for withdrawal. So in just the same way that the Eurozone elites claim the “euro is irrevocable” and Member States have no way out, Edward Heath was receiving advice in 1971 that this surrender of legislative authority would have “no provision for withdrawal”. … that in negotiations with the rest of the world on matters forming the subject of common Community policies, there would be joint representation by the Commission. The Community being exclusive in character and membership also means in practice giving up some of our important links with the remainder of the world (Commonwealth Preference for example). Australia certainly felt the cold winds that followed Britain’s abandonment of its previous Commonwealth arrangements with respect to trade and other cooperative ventures. We were droppped like ‘hot cakes’! The Report considered the restrictions that would be placed on internal law making in Britain (so-called “internal sovereignty”). the community system requires that such Community Law as applies directly as law in this country should by virtue of its own legal force as law in this country prevail over conflicting national legislation. And so it went. The FCO briefing report continued to outline how joining the EEC would be “a further large step away from what is thought to be unfettered national freedom and a public acknowledgement of our reduced national power; moreover, joining the Community institutionalises in a single, permanent coalition the necessary process of accommodation and alliance over large areas of policy, domestic as well as external”. It would subject Britain to a “remote bureaucrasy” which is “more powerful than compared with the democratic systems of the Community”. We read that the European Community is not democratic, that “in the longest term the progressive development of the Community could indeed mean the weakening of the member states’ independence of action and in the last resort of their national institutions and their sovereignty”. In other words, don’t tell the public the bad news! In April 1970, for example, only 15 per cent of British voters indicated they were in favour of joining the EEC. In Heath’s elevation to the top job on June 15, 1970, the issue of joining the Common Market was played down. But upon election, Heath’s pro-European mission began in earnest. The Government certainly followed the advice of the FCO Report by misrepresenting what accession would mean. In the White Paper, the Tories presented to the Commons outlining the accession, which was accompanied by a public pamphlet stressed how the accession was really just an entry to a common trading structure – the Common Market. The usual claims were made – British industry would have better access to markets abroad – etc. The public document said that there would be no compromise to British sovereignty, despite the secret FCO briefing report saying exactly the opposite. There is no question of Britain losing national sovereignty; what is proposed is a sharing and an enlargement of individual national sovereignties in the economic interest. There were also claims that the British fishing industry would be protected but the accessions negotiations subsequently revealed that there was no such undertakings. History tells us that the industry withered. We have said that as members of the enlarged Community we would play our full part in the progress owards economic and monetary union. That was confirmed in my talk with President Pompidou and in my statement to the House. We have said that we are prepared to envisage a gradual and orderly run-down of official sterling balances after our accession. We have said that after accession we would discuss measures by which a progressive alignment of the external characterisics of sterling with those of other Community currencies might be achieved. Both of these developments would be viewed in the context of progress towards economic and monetary union. But let me make absolutely clear that we have given no undertakings as to how fast or by what means these developments could or should be brought about. These would be matters for discussion after our entry, when we should be a full member of the Community with all the rights of a member. He was specifically asked about the status of the pound if accession went ahead. He fudged his response (you can follow the debate at the link in the previous quote). … did not regard sterling as an instrument of prestige nor did they feel sentimental about it. He also affirmed that Britain would “go as far and as fast as the Six towards the harmonisation of economic and monetary policies from a customs union to an economic union”. (see PREM 15/ 372 Pages 101-201. It was also revealed that in the wake of the Hague Summit 1969 (and the resulting Werner Report) that the transition to a common currency would be completed by 1980. He evidently told Heath this at the Paris Summit in May, 1971. On the Labour side, Tony Benn was opposed to entry because he considered it would compromise democracry within Britain. … the most formal surrender of British sovereignty and parliamentary democracy that has ever occurred in our history. The FCO briefing report did not disagree! A significant proportion of Labour Party MPs at the time were similarly against the idea of accession. They understood that Britain would be entering an arrangement where corporations dominated policy making with the interference of the IMF who had as Benn wrote in 1981 “no allegiance to the nation”. Tony Benn was also worried about the erosion of workers’ rights. As is the case in the current debate, there are those who claim that without EU membership, the conservatives will ravage the rights of workers in Britain. Back in time, this issue also weighed on the Left. Even during the 1983 national election, the British Labour Party were campaigning to exit Europe and that sentiment continued up until the late 1980s. But interestingly, it was the then President of the European Commission, Jacques Delors who shifted opinion among trade unionists and set the Pro European trend that we now observe within the British Left, which will probably push the vote in favour of Remain tomorrow. Talk about a wolf in sheep’s clothing! I remind everyone that Delors, a so-called socialist was the Economics, Finance, and Budget Minister in the Mitterand government (1983 to 1984) who strengthened the neo-liberal program that Raymond Barre had begun in the 1970s. This was the famous ‘austerity turn’ that the Mitterand socialists imposed on France as they became neo-liberals. Delors then moved to Brussels and pushed through the Maastrict Treaty and the mess that we now see as the Eurozone. But he certainly schmoozed the British trade union movement in 1988. He gave a famous speech – Speech to Trades Union Congress – at Bournemouth, September 8, 1988. That won over the TUC and one might suggest that at that point the British Left lost perspective. In an article I read last week (June 16, 2016) – Labour: for the EU, against the people – the author (a lawyer) argues that “Corbyn’s party has lost faith in democracy”. Effectively, it is arguing that the British people cannot be trusted at the ballot box. Give them the freedom to elect a government, with real power, and they may choose the wrong government that passes the wrong laws. Wisdom, in the eyes of Labour, lies not with the people, but with bureaucrats based in Brussels. I often receive E-mails from those who suggest they are sympathetic to the Exit case but worry that it would give carte blanche to the neo-liberals to wreak havoc. My response is as now – if it is bad enough you can vote them out. You cannot vote Brussels out. Jon Holbrook’s take on this is that Delors and others “persuaded many to do what Benn warned them not to do: to believe that a good king was better than a bad parliament”. But if the opinion polls are accurate, the people are not convinced. British Labour according to Jon Holbrook now “reflects the interests of a European elite”. He surmises that British Labour is now seen “as the party of the metropolitan elite” and has lost faith in the judgement of the people to determine their own destinies via the ballot box. Labour gave up on the ballot box decades ago, and the people are now using the ballot box to trash the Euro-elite that Labour stands for. Somewhat longer than I planned but that is what happens when one gets lost in the archives. I hope tomorrow that Britain votes to leave the European Union. If they do they will be voting to restore the capacity (potential) of the people to resist the corporate elites and their servants in Brussels who have overseen the most brutual neo-liberal austerity – the most horrific treatment of people for decades. They will be rejecting the corporate elites who have wined and dined the political elites of Europe to ensure the distribution of income is pushed further in their favour. They have left a nation (Greece) is a supplicant, depressed state. All the talk in the late 1940s about creating political structures to ensure Germany never went to war again are now irrelevant. NATO prevents that not the European Union. The European Union – the ‘European Project’ – is a decaying, necrotic arrangement that is incapable of dealing with the challenges of the present, much less the future. Its economic design has failed. It is incapable of dealing with the migration issue. It has long gone past its use by date. Britain is already half out of the EU because it never joined the Schengen area or the Eurozone. Unlike most other EU members, Britain still has its own currency and border controls. The referendum is therefore not as important as it would be if Britain, unwisely, had accepted the Schengen agreement and the euro. This debate is not about Britain losing sovereignty, it’s about whether Britain should be bound by some international obligations or not, and the distinction is not just semantics (however, -it is- international law 101). EU treaties are international treaties. Sovereign states enter into international treaties all the time, the implication being that they accept international obligations and not that they will be policed into respecting those obligations. Just because, say, Russia entered into many more and much more onerous international treaties than Eritrea, does not mean that Eritrea is the more sovereign state of the two. There are absolutely no consequences apart from reputational damage should Britain refuse to respect the EU treaties starting from today and also Britain can organise a million referenda to exit EU at any time in the future, or it can just exit the treaties without a referendum if they decide to do so. The sovereignty of Britain is simply a moot issue. @James shipper, EU legislation is behind the privatisation of the post office, the rail system, and the introduction of market bidding inside the nhs. TTIP will be a disastrous attack on social democracy. Just this evening I read this criticism of the debate by Professor Vivien Schmidt. She calls out the issue that had me decided the vote didn’t matter either way. There is no discussion on neo-liberal policies which Britain and the EU have adopted, equally disadvantaging both camps. My vote would choose which ever camp first disavows neo-liberal policies. Interestingly the UK has been very favourable to the EU going neo-liberal, so maybe the EU will benefit more from a Brexit! Public anger is being chanelled to the Right due to the abject failure of the Left which you document. Voting out only makes sense WITH the prospect of a Labour Government getting its act together, the chance of which is as likely as Halley’s Comet passing my window in the next ten minutes. So the whole referendum is a farce and a no-choice situation a bit like the American Presidential race. I will be abstaining. Brexit + Don’t vote for conservatives in the next election. This operates on two levels which solves the problem and has the least drawbacks. Any pro-remain in EU campaign largely funded by goldman sachs should have drawn the attention of the left which has lobotomized itself on the issue. And the left fall into the trap that supposes the government will do nothing post-brexit they can always negotiate deals for people to retire in any country, work in any country, get healthcare in a euro state, bring in ceilings for roaming charges, warranties on products, share criminal information with europe (whatever the issue). EU law can wave the magic wand to have this happen or the British government can makes no difference. One has intractable drawbacks the other doesnt. Leaving the EU will not solve any of the UKs real problems. Inequality and under investment will remain whether we stay or go. The most intractable problems we face such as global warming ,terrorism and immigration can only be solved by real cooperation across national boundaries. The UK has long boasted that unlike the rest of the world it does not have a written constitution. Instead it has an unelected second house and a creaking electoral system that ensures a political party can become a Government with the support of less than forty percent of the electorate. Do we all really think that real sovereignty will be returned to the people of the UK if we vote to leave? The UK can leave the EU but it can never leave Europe. Its problems with the EU are are a consequence of the UK’s semi detached neo liberal elite. The UK needs a progressive engagement with Europe not a retreat into splendid isolation. I find it odd that the main argument for the EU is that we need it to prevent another WW2. Americans don’t fear that Mexican–American War would repeat itself, or that there is a risk of another Civil War. They have recognized that world has changed, European fear of the coming war is quite unique phenomenon in the world. Indeed, wars have become less frequent all over the world and historically we are living in quite peaceful times. That has nothing to do with european union. As an example how much world has changed, main political aim of the nazi party was not economics, not jobs or law&order, but to conquer more ‘liebenstraum’, ‘living space’ from surrounding nations. How many parties in europe are campaigning for this today? There are no such parties. World has changed. The argument always seems to boil-down at its core to the merits of the nation-state versus those of a confederation. The same argument raged in the USA (substituting “the states” for “the nation-state”) starting after the Declaration of Independence and the drafting of the constitution – if not even earlier – and lasting until the outcome of the Civil War finally settled the issue between on the one hand the federalists and on the other the champions of states’ rights (from Jefferson onwards) – in the formers’ favour. In the process many tens of thousands lost their lives. It can be argued that their unswerving dedication to the principle of states’ rights more than any other single factor caused the military defeat of the Confederacy: it most certainly wasn’t that their generals or the fighting qualities of their troops were inferior (the reverse was true, if anything). Either one believes as a matter of faith that the nation-state represents the nearest approach to perfection that is attainable on earth (Hegel’s view, Prussia – believe it or not – being the exemplar for him) or one doesn’t. Personally, whilst conceding that it can have its merits, it still seems to me to be above all else the embodiment of tribalism writ large – replete with all the faults that that suggests: self-aggrandisement, chest-beating bellicosity, xenophobia, arrogance, to mention but a few. But that’s just a personal view. We each have to decide where we stand in that debate and there’s no way to test objectively which is the more “right”. In many ways the EU experiment has been a dismal failure, although it does also have some successes to its credit. But it needn’t have been, and it could still pull itself round. Britain staying inside seems to me to offer the best chance of that happening, because there are plenty of people in the other countries who think the same way with whom we can make common cause. And the point that Benn and, following him, Bill make so much of – the supremacy of Parliament – seems more than a bit bogus to me. MPs had been turned by the party-system into lobby-fodder long before Britain joined the EU. The secular trend has for long been an inexorable shift towards an ever-greater concentration of power in the hands of the executive and its creature the bureaucracy, accompanied offstage by an ever-greater accrual of wealth, privilege and power to the plutocracy – the financial sector and the captains of industry. We are being governed by an oligarchy whether inside the EU or outside. And when Labour was in power in the ‘seventies there was no difference. The oligarchs just changed – into trade union bosses. Are we supposed to accept that that was somehow more democratic? Phooey! James-I’d take Craig Roberts with a pinch of salt ( a maybe a pillar) he’s making a good carrer as conspiracy theorist AFTER being on of the main architects of Reaganism. What! This man was one of the key linchpins of the neo-liberal onslaught and is now critical of the Frankenstein he helped to create when he is in a comfortable spot himself. He doesn’t even admit that he was one of the prime movers of the whole process that got us here! He got the 1% rolling and I would suspect he’s walleted enough to be close to being part of them. I’ve no time for these characters who went with the flow in the 80’s and is now making money trying to expose the conspiracies they were par of themselves. There’s a lot of these shysters around that only speak out when it is safe to and they can sell a few books and keep a media presence going. In any case he doesn’t live in Britain, clearly doesn’t really understand what is going on here and the bogus choice affecting ‘us’ tomorrow. As I said I will NOT vote for neoliberalism IN or neo-liberalism with added Xenophobia OUT. Sod the whole dumbed-down thing! I fully agree with the arguments presented in the article. The main issue is that from functional point of view many Western countries are less democratic than China or Russia. We need to get back to basics. What is the so-called “democracy” about? Is it about the existence of institutions like a constitutional court? This sounds like fetishism to me. The rule of law is a tool. It can be used to defend the liberty of individuals or it can be used by the rich oligarchy to trample the freedom of population. There was an article on the Reuters about a man who sued the KGB in USSR in 1982. But wait, what happened to Assange? How is he enjoying his personal liberty now? The essence of democracy is that the ruling elites represents the interests of the majority of population. The ruling elites in European Union do not represent the interests of the majority of Greeks, Italians, etc. Looking at unemployment rates I dare to say that Vladimir Putin represents the interests of Russians or Aleksandr Lukashenka represents the interests of people of Belarus better than the current democratically elected “progressive” leadership in Greece and their overlords in Berlin and Brussels. The same is true when we discuss the functioning of the political system in the UK and in Australia or the US. I am sceptical about the final outcome of the referendum in the UK. The global plutocracy won’t give up. In the end I won’t be surprised by the rising unconscious hatred towards the political class as a whole and looming de-legitimisation of the so-called “Western liberal democracy” in the minds of the people who hate the system marginalising them but feel that “There Is No Alternative”. After decades of thorough brainwashing (recently using so-called social media) and poisoning the minds with consumerism while income sources are scarce – and the only sure way to get money to overconsume is to take a payday loan – the only viable alternative to liberal democracy is the medieval religious ideology from the Arab Peninsula (rightfully condemning globalised usury) – or the self-replication of Trumps what actually changes nothing. It would be better to restore some aspects of the so-called democracy before it is too late. Without peaceful dissolution of the current order there is no slightest chance anything may be reformed in Europe and elsewhere. The use of the horrific death of MP Jo Cox by politicians and more so by the media, especially The Guardian, to swing the vote in REMAIN’s favour has been abhorrent. I can detail the specific articles and there have been many of them. I still hope for a LEAVE victory but unfortunately we currently have no political party that can use such a result in a progressive way. It’s been a horrible campaign and I’m glad it’s over. Simonsky (or is that Simon Sky) and Bill you don’t have the correct new language yet. This it it. They will be rejecting the Corporate Elites (rely just .01% of new and old money, lets call them The Masters like in Doctor Who) who have wined and dined the Protected Class of Europe to ensure the distribution of income is pushed further away from the UNPROTECTED CLASS. So the Masters unduly influence the Protected Class who make the rules for us Unprotected Class. Our Unprotected Class have little or no employment security past the next pay day. The Protected Class Starts with the Politicians and includes anyone in a secure job devoted to the State. The Unprotected Class look to the Protected Class for Protection. The Unprotected Class also wish to be in the Protected Class. The Unprotected Class are eyeing off the Protected Class with growing disdain , all over the world. If the Protected don’t look after the Unprotected the Protected Class will collapse into the Unprotected Class. Sort of like Greece now. If you like Drama think of it like “Brussels will Fall” just as Rome did. Death by Administration. Now the Unprotected Class like this lingo. Your going to hear a lot of this lingo very soon, it will be everywhere you read. Andy- ‘I still hope for a LEAVE victory but unfortunately we currently have no political party that can use such a result in a progressive way. ‘ This is why I will abstain. There is no choice. The idea that we Leave, get turned into a xenophobia, jingoistic theme park by Johnson and Gove who will internally devalue the hell out of what remains of the workforce that has already copped it. I agree with economists like Bill and Steve Keen and Richard Werner that from an academic economists perspective it is necessary to leave -but none of them look at the reality on the ground. I don’t find anything to disagree with in Bill’s work on the whole but when he writes: ‘I am not sympathetic to very much that the right politicians espouse and do not think voting to leave is tantamount to nurturing their whacky ideas. ‘ I have to say he has this BADLY wrong and is lucky that he won’t be living here if Farage/Gove/Johnson are in anyway triumphant. The debate has been utterly repulsive and disingenuous to the core. When Bill says people like Farage are ‘right’ to want to leave, he forgets that these people are doing it for the WRONG reasons, which is, in a way WORSE! Farage has been emotionally manipulating and grooming the discontent in the populace by supplying them with simplistic , black and white explanations for their troubles and recently came up with a poster that harked back to the 1930’s in its xenophobic intent. The man is a foul charalatan and highly dangerous because we have a tired, stressed and demoralised populace after 40 years of neo-liberalism sucking the life-blood out of them; they are easy prey for the snake-oil salesmen. I think that the so-called “ordinary people” feel that they have been taken for a ride but they are unable to understand how the ruling oligarchy has been scientifically brainwashing them for decades. One of the principles of the EU is free movement of capital. Another principle (enshrined in the Treaty of Lisbon) is systemic and automatic austerity. 99.9% of the “ordinary” people still believe in a vulgarised loanable funds theory – they think that banks lend out pre-existing deposits (and therefore pre-existing financial capital is required to finance any investment). They also think that the same pre-existing financial capital has to be borrowed by the governments if they want to spend more than they get in taxes (and printing money is a road to Babwe or worse). EU is built on these principles and well-wishing people like Professor Varouf–s are extremely naive when they think that the whole system can be reformed without pulling down the golden calf of financial capital from the altar. The plutocratic and anti-democratic EU has to cease to exist if a new and true European Community is to be built bottom-up. I don’t think that conservative oligarchy will make any changes to the way things work in the UK even if they leave the EU but this would be the first step in breaching the new Berlin Wall and dismantling the virtual jail the peoples of Europe are trapped in. Such a simple error undermines everything else he has to say. Good article by Bill though. Neither option looks all that attractive tbh. UKIP withdrew that poster within hours. The Guardian has been publishing it 4 times a day since and, in nearly every case, linking it not so implicitly with Cox’s murder. The first 2 articles on the same night as the murder. It’s a little bit more than that. They are international treaties that co-opt the enforcement mechanisms of the state so that private individuals can enforce the treaties against their government. That’s what makes them a little bit more than just treaties. Its the Investor-State Dispute Settlement clauses that are the problem – all over the world, not just in the EU. That is the encroachment of Corporatism that we all need to fight. For example under the EU treaties the UK is prevented from nationalising its railway. If it did in breach of that, then all the train operating companies could just sue the government for large amounts of compensation and damages, and possibly injunct the government and prevent them moving ahead with the process. It’s cleaner to leave and start the process of burning all treaties with ISDS in them. Neil, they aren’t all over the world quite yet, hence the need for TTIP, the worst of the lot. And the cases will be settled in a US court. Of course, a sovereign government could refuse to abide by this particular clause should it wish to. What would the US do? A neoliberal government could be bullied because they would not use the powers they have to protect themselves and their environment. Get rid of neoliberalism and such treaties would become null and void. Bill, a Swedish MEP was interviewed last night and provided an argument for leaving the EU similar to yours. In addition, he thought that a vote to leave by the UK would push Sweden to leave, as they hve already considered doing so. An example he gave was instructive. In a previous life, he was a truck driver. It was a good idea, he thought, to have universally applicable standards for truck driving, but in the absence of a level playing field (my words), it could not work, as the competitive framework would result in companies and individuals competing on the level of price rather than on quality of service, with the driver doing the job for the lowest price getting the work, and being paid peanuts and working under rather poor working conditions. The main reason he thought this particular bill was constructed the way it was was because most MEPs have never had a real job in their lives, not unlike the current UK cabinet. Hence, not just that they didn’t, they were unable to think it through and ignored alternative views. Although I agree that the Euro currency system is an absurdity and the institutional framework is autocratic, for me, it is a choice between two evils, not unlike the choice between Clinton and Trump. Hence, I agree substantially with Simonsky’s reasoning but would vote Remain. And I also agree that sovereignty is a red herring. Ladbrokes has the odds at 3/1 for Remain and 8/1 for Leave, with your money back as a free bet if you lose. Agreed, but the trouble is that if the Left totally fails to offer to represent, and address the needs of, an increasingly large disaffected and disenfranchised section of the population, and the Right does (albeit falsely), then that cohort of people will chose the Right, because no-one else is interested in addressing their grievances. Farage will be Farage – but the real disgrace is the suppression of any leftwing alternative in UK politics to challenge the neo-liberal consensus for the last 30+ years. And Corbyn’s half-hearted Remain stance extends that failure. Bill’s attention to 1970’s UK politics, and Healey and Callaghan’s betrayal of the working class, explores the roots of this abandonment, and it’s been a complete and utter tragedy. A likely Remain victory will change nothing for these people; their problems will worsen if anything, and UKIP will very probably go from strength to strength. ISDS clauses are not enforcement mechanisms, they are just dispute settlement mechanisms. A decision by a regional court or an arbitral tribunal is nothing more than a legal effect of the underlying treaty. Under EU treaties the UK has international obligations, but the enforcement of those obligations is exclusively a domestic affair. Bringing the UK before the ECJ for nationalising its railway is not enforcement. With the UK divesting itself of the EU treaties, the case brought before the English courts would be simply a matter of English law. So far, the EU members have been remarkably compliant with the obligations stemming from the EU treaties and its “secondary legislation”. That’s not necessarily the case with the ISDS mechanisms under the investment protection treaties. Good luck enforcing the Yukos decision on Russian sovereign territory. Also, see the Micula case (ICSID), with Romania refusing to enforce an arbitral decision which was incompatible with an European Commission decision. The consequences are reputional only. Just like the money multiplier model, the scholarship that tries to paint the EU treaties as constitutions or as some sui generis bird is garbage that is constantly fed into the brains of unsuspecting students all over Europe and it needs to stop. There was never a “transfer of sovereignty” to the EU. EU treaties have no constitutional or sovereign legitimacy, and even more so after the failure of the TEC in ’05. The issue of racism in the UK is largely irrelevant to the EU referendum debate. Racism is largely confined to the baby-boomer generations (though not completely), who grew up when a casual disdain for the ‘other’ was accepted. When I was young I used to hear jokes starting “there was an Englishman, an Irishman and a Scotsman…”. I haven’t heard those jokes for 30 years now. Why? My guess is that the generation who had social integration issues with other nations within the UK have died off. Jokes about other ethnic groups around the world were common amongst somewhat later generations, but they too will disappear when those generation die off. Membership of the EU has nothing to do with this, because even without an EU it is inevitable IMO that cultures intermingle with some friction, but over time the friction passes and the newcomers are (mostly) accepted. I have just voted to Leave because it has nothing to do with race but where the power lies – with the people or the elite. Leaving is a step in the right direction. After Leaving we can then address the power of the elite (democratically) within our own legal and administrative boundaries. Mr. Shigemitsu, we are also co-bloggers on Richard Murphy’s site, so nice to meet you here (I’m plain Simon on that site!). I’m in agreement with you 100%. Bill’s work on the failure of the Left in the mid 70’s is highly illluminating and important. I think Ralph Milliband was writing about the failure of the Left during the 60’s; he felt Labour missed a unique opportunity to radically transform Britains , institutions. Brexit wins 51.9%! Cameron resigns! Woohoo! So, 4 years of economic uncertainty, political turmoil, and a recession. Woohoo? @dnm as opposed to the last 8 years since the GFC? Vote for Corbyn or a politician that understands its spending abilities and spread the word about MMT with people. You could alsor start a political party like the one you’ll see if you click on my name in Australia which I’ve joined. I’m happy because I hope the EU zone either reforms or collapses and countries can get back to running their own economies again or do you like mass unemployment and human suffering especially Greece? I’m trading forex and the markets (using MMT via Mike Norman) which are absolutely irrational and emotional so it’s a great day to take money from the big banks and the 1%. Whether there is a recession or not will have nothing to do with the vote today. The British government can always prevent a recession unlike say the Italian government. Just a request to those, including Bill, who have used phrases like “pro Europe”, “pro European”, “the European project” or similar! We aren’t against Europe per se. We are strongly opposed to the European Union though and in particular to the undemocratic nature of it. We can, and should be, both anti-EU and pro Europe! ….and we can always rejoin when they’ve got it all working properly. Apparently Italian polling prior to this had 48% wanting to leave the EU. Wait for an actual EU member to leave and then maybe Germany might get the message that they need to either change the EU setup or it will collapse. Wait for Italy or Spain, actual EU members decide to leave and then the real action will begin. As Peter said I’m very much pro Europe just anti the neo-liberal EU single monetary union and all the horrible human suffering and austerity being pushed undemocratically. My UK passport is likely to be less useful now as far as freedom to work or move in Europe but I don’t care, I care more about the mass human suffering of the last 8 years with no end in site…. Yet. The consequences I outlined have a high probability in the short term. What happens further down the line is less certain. It’s a bit too soon for fist-pumping (“woohoo”). Of course it is possible for a future government to enact policies that would greatly reduce the likelihood, and the consequences, of a recession. But the current lot (who were voted in by the public not so long ago, don’t forget) are ideologically opposed to such policies. Maybe yesterday’s vote will bring forward the day in which the EU collapses under the weight of its own contradictions, but I’m not holding my breath. A lot of my liberal friends are running around like chicken little screaming that the sky is falling as a result of this vote. Most of them don’t even live in Europe. How do I succinctly persuade them that this result isn’t a disaster? I was asked if I wanted to remain in the EU and in my opinion the EU is working against the interests of the majority. he can make the rich richer when he becomes PM. Dnm:The consequences I outlined have a high probability in the short term. Perhaps in the very short term. But it is a clear positive in the only slightly longer “short term”. The masters of the EUzone dungeon got a wake up call. Those on the rack – like Greece – will see that the sky will not fall; that Donald Tusk & the other Eurocrats are sillier oracles than Chicken Little. For the resistance to leaving the EU & even more important, the Euro, are overwhelmingly psychological, from cognitive capture of those like the hapless Tsipras, not rationally based. Austerity and its tool the Euro, judged from any perspective but that of sadistic oligarchy, is an extremely stupid policy. It’s like hitting yourself on the head: it feels so good when you stop. The positive results are quick and reliable, a matter of months at the most. So how is one to maintain a policy of austerity? A policy of doing nothing, of making people do nothing – and then blaming them for doing nothing! Brexit is trouble for this. For Brexit is something – it is not business as usual, it is not the apathy, the enurement to misery that culminates in abject submission that the Euromasters desire so ardently. It will tend to terminate this unstable pattern of inactivity. When ordinary people are in the mood to not listen to scaremongering BS and to do something, they won’t listen and they will do. They have now exercised their power over those who think of themselves as their masters – which can only encourage further efforts, can only make the masters step a bit more carefully, to put the lions back to slumber. For it takes a lot of effort, massive brainwashing to maintain neoliberal hegemony, to make today’s societies economically so much less than the sum of their parts, to expound and follow such inane theories. You have to admire their worldwide success in convincing not only academics, but ordinary people to believe that 2 + 2 = 3. But this is a major crack in the ideology of nonsense almighty (TINA). Note: I again recommend Neil MacCormick’s The Question of Sovereignty, that Bill has quoted from here (h/t bill), for a very balanced and nuanced discussion of that question. MacCormick notes that the highest courts in Britain, Germany (& Ireland?) have already spoken on the matter – and said that the Euro treaties did not ultimately cede any essential sovereignty. The only treaty for which one can make a decent case for essential cession of sovereignty is one that people always forget about, because it is too obvious – the hardest place to find things is always in front of your nose. (e.g. Bill’s IMHO “NATO prevents that not the European Union.” is right about the EU, but cites the wrong other treaty & organization.) The right one is the treaty that explicitly says it overrides all other treaties, the one that all other modern treaties, including the Euro treaties, explicitly say they are subordinate to: The UN Charter. “After Leaving we can then address the power of the elite (democratically) within our own legal and administrative boundaries”. The purest of pure wishful thinking IMO. The power of the elite in the UK – or what’s left of the UK after all the dust has settled – will become decidedly more entrenched than now under the right-wing Tory government which will then be in power for a generation, opposed only by a Labour party which itself will have moved back to the neo-liberal centrist position which – as Bill so vividly describes – it began moving towards in the ‘seventies and – apart from the Corbyn faction – still occupies. Corbyn is of course already doomed as leader. To seek to preserve London’s dominance as a financial centre against the strong attacks which will be mounted from within the EU, which psychologically started within hours of Brexit becoming a fact and will gather in momentum and intensity as the exit negotiations get under way, a Tory government already predisposed ideologically to do so will have a perfect pretext to water-down the moves towards tighter regulation which have taken place since the financial crisis. It will be “the Big Bang” all over again. The Deutschlanders started WW’s 1 & 2 and lost both; and now Merkle and Schauble seem hell bent on no.3; obviously hoping for 3rd time lucky.